I have been making this recipe for what feels like my entire life. I started making it when I was living with a vegetarian roommate, and we kept a steady stockpile of mushrooms on hand. At the time, the portabella mushroom was making a huge statement in the veggie world and everyone was enjoying them including us. In case you are not familiar with a portabella, it is the larger and meatier cousin of the criminis. One thing I love about the portabella is that their stem has a firm texture and can be cooked along with the caps. I use to often grill or pan fried one and enjoy as I would a steak. 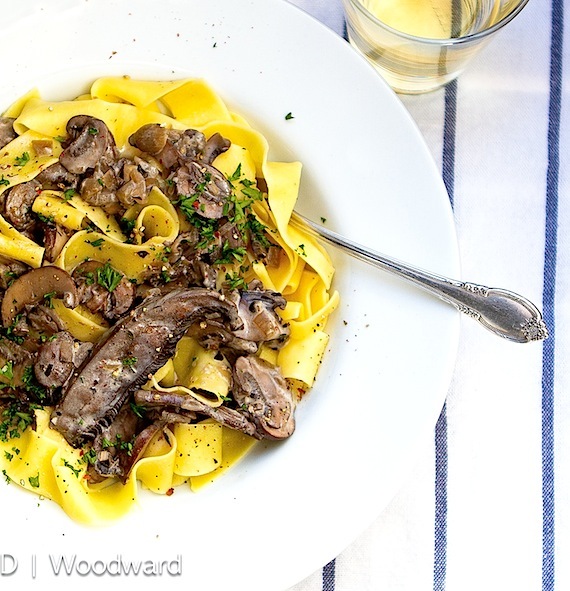 One night after a long day I work I wanted something more hearty and came up with this recipe for Mushroom Stroganoff. The meaty texture of the mushrooms was a great substitute for the meat that is usually used. This recipe has evolved over the years, in my opinion all for the better. I, use too, mostly, use brown button mushrooms also known as criminis in my meatless stroganoff. I now make this recipe with a combination of whatever fresh mushrooms I can find. I have made this recipe using, Black Trumpets, which add a lot of flavors, as well as Chanterelles, Clamshells, Maitakes, and Morels. 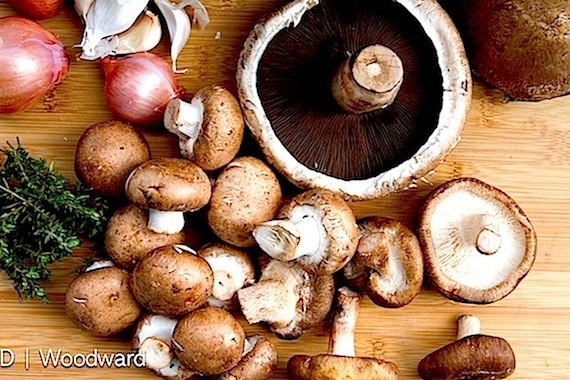 Each variety of mushroom will add a unique flavor to your stroganoff; do not be afraid to experiment, have fun with this recipe. Do keep in mind, that mushrooms need to be treated delicately when you are cleaning them, they are like a sponge and will absorb everything. I use a mushroom brush or a paper towel and gently clean off any dirt. It takes a little longer than throwing them into a sink of water. Trust me, after years of experience, I have found, YOU DO NOT WANT TO WASH WITH WATER. This will only water log your recipe, causing it to be sloppy and bland in flavor. The other day, I found some gorgeous portabellas at the market, so I decided to revisit this old friend. Besides the portabellas, the mushroom selection was a bit grim in my market. I did not have several options, so I added shiitakes as well as criminis to my basket. Regardless, they were gorgeous, and I could not wait to devour them. In addition to my sauteed mushroom medley, I added a splash of white wine, to give it a bit more depth. I kept the seasonings simple, a little fresh thyme, garlic and shallots, some spicy Worcestershire Sauce as well as a little dry mustard. Keep in mind if you are a strict vegetarian or vegan, you will need to eliminate the Worcestershire Sauce as it does have anchovies in it. Gluten Free? This is the recipe for you! I could not find the gluten-free noodles I have been favoring so I went with some gorgeous egg noodles, which were perfect for sopping up the delicious, creamy broth that the mushrooms were splashing around in. This is a deliciously easy recipe that you can have on the table in 45 minutes. Add a salad, glass of wine and bread (gluten-free if you are going this route) and you have the perfect meatless meal. In a large dutch oven, over medium, gently heat the olive oil. Add the shallots and cook, until soft; about 4 minutes. Add the garlic, stir. Next add the thyme, salt, pepper, mustard, and Worcestershire sauce; stir and cook for a minute. Add the mushrooms, stir; cook over low heat until slightly wilted; about 10 minutes. Add the stock and wine, stir, and cook over low heat, for 30 minutes; until very fragrant, the broth will be slightly reduced. While the mushrooms are cooking, cook your noodles according to directions. Drain the noodles. I rinse the noodles with cold water to stop the cooking, then put them back into the same pot I cooked them in and toss with a very small amount of olive oil. Before serving, stir the sour cream into the mushroom mixture and gently reheat over low heat. Season to taste with more salt and pepper, if necessary. Toss the mushroom mixture with the noodles. 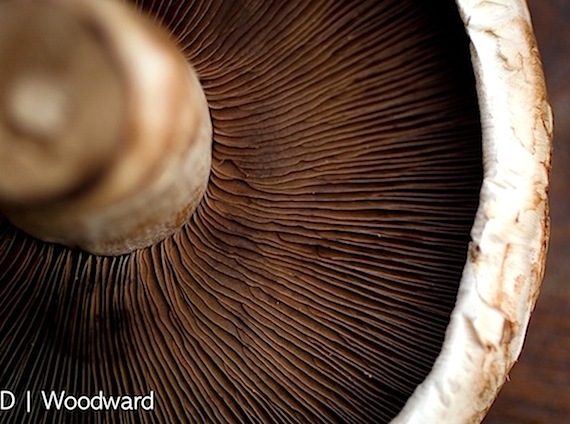 18 Responses to "Mushroom Stroganoff"
I love portabella and criminis with pasta! I agree, the white wine in the sauce is a delicious addition. Mmm. Ah, but I've never made white sauce with a sour cream base and I'll have to keep that in my idea box for next time. There's always something new to try! That looks really good. Mushroms are the perfect meat sub, they're nice and hearty. I'll have try this when I do meatlss meal. I never thought to do strognoff with mushrooms. Thanks for the idea. More mushrooms is always a good thing. Love the mix of the 'shrooms + butter + sour cream. How can that not = love? Beautiful! And I don't think my husband would miss the meat too much. It's Lent now, so it's great to have these simple and wonderful vegetarian recipes. Thanks for sharing! Ummmm, Worcestershire Sauce is made from anchovies. This is not a vegetarian ingredient. thanks! i had to modify your recipe to match what i had on hand, but it turned out great! i linked to your recipe and posted my changes. I'm only halfway through cooking this and I've already eaten a few spoonfuls, and IT IS DELICIOUS. Mushrooms are so great and varied, so it blows my mind how well this preparation lets their true colors shine through while still adding and complimenting the distinct taste and texture. Thank you for this beautiful recipe. Lorie! I love this recipe and I love your style of "food critique!" Number one... I love Portabellas on the barbecue! They are so hearty that they can replace meat! I can only imagine how good they will be with these wide noodles. I shll copy and paste and cook. I think that this is a really good recipe, but I made a few subtle variations. Instead of stock and worstershire (vegetarian) I used a cream base made from a rue and vegetable boullion cubes. For people who don't know how to make a cream base, though, you can use a little bit of cream of mushroom soup, and cream or milk. I love mushroom stroganoff. My mom used to make beef stroganoff and I am a strict vegetarian, and we came up with our own variation that is still creamy and delicious. I love seeing other variations of the recipe to keep making it better. My fiance just decided to go vegetarian, and I wasn't ready to give up stroganoff. I made this tonight, and I think it's better than any meat stroganoff that I have ever made! I can't stop raving about how wonderful it was. I made it as is (oh wait, I doubled the wine/veggie broth sauce) and it was PHENOMENAL. Thank you so much!